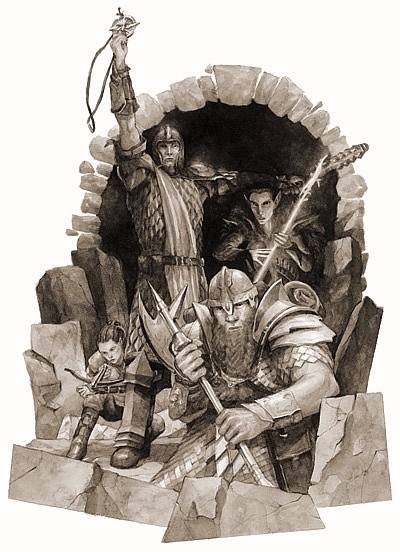 There are four Castes each comprising several primary character classes for Aeres. Other primary classes or sub-classes may be added to the list periodically or if a particular milieu is being used and these will be noted under the proper Caste. Each class has a list of Class Abilities, which the character gains when achieving the lowest level in any Title group. There is also a column listing Attribute scores. A character must meet the minimum number in this column in order to advance into the next Title group. If they do not meet the minimum then they must either halt progress in this class or find a way to increase the requisite attribute. -These classes rely primarily on martial skills. They comprise the Mercenary/Soldier who represents the purest form of fighter, to the Knight: embodying chivalry and mounted combat, to the Swordsman: the premier weapons specialist, to the Templar: the temporal hand and force of his religion, to the Ranger: standing as the defender of civilization and the protector of the weak in a savage wilderness. -The Mage classes focus on wielding the magiks of different schools. Wizards learn Enchantments, Evocations, and Transmutations. Sorcerers are masters of Wards, Circles of Power, and Conjuration. Magicians focus on Illusion and Charms. Necromancers practice the dark arts of Necromancy and Infernal Invocations. Mystics are adepts at wielding the magiks of Mentalism and Divination. 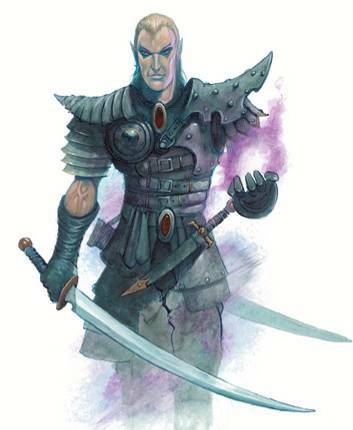 -Rogues comprise the classes that make their way in the world by wit, guile, and sometimes by the edge of the blade. Thieves practice various disciplines of pilfering, lock picking, and shadowed attacks. Assassins master the art of murder and information gathering. Privateers hone the skills of deal making, adventuring, and freebooting. The Bard earns his living by charm, sleight of hand, and intellect. Finally, the Huntsman lives by collecting bounties, poaching, and using both stealth and strength to act as a scout. -The Savant heading covers classes who employ Talismans, and usually follow either a strict religious or ritualistic order. Priests are the most common Savant being the missionaries so to speak, and act primarily as the conduits for the physical manifestations of the divine among the mundane. In this role they employ Talismans, weapons, and words to combat enemies of the faith and bolster the believers. Druids are similar to Priests except that they stand as the representatives of the Old Faith. The Warlock employs arcane Talismans, mixes potions, and calls on the restless spirits in nature for aid. Monks spend their lives mastering intricate rituals that strengthen their minds, bodies, and spirits looking to follow sometimes obscure paths leading to a greater cosmic awareness. Shamans are the spiritual and often secular leaders of their tribe or clan and they gain their power from the collective consciousness of the people. They defend and preserve the way of their culture. Characters with two classes are permissible with the restrictions listed below, but the Game Master is always the final arbiter in all cases. Characters wishing to leave off one class and pursue another must submit to certain restrictions and meet certain requirements. First and foremost the character must have a minimum score of 15 in the primary attribute of the class he is currently following. Secondly, the character must meet the minimum requirements in the attribute scores of the class he wishes to pursue. Once the character has embarked on his new class path he may not use the skills gained in his previous class until he has equaled it in level. If at any time during an adventure he does use skills from his former class or classes then experience is either forfeited or applied to the previous class at the judgment of the Game Master. Once the character has achieved a level equal to that of his initial class he may then use skills from both at his discretion and at this stage future experience is divided evenly between the two classes. It is important to note that any class restrictions due to race, class or attribute are still in effect. A Dwarven fighter may not choose to pursue Wizardry as a second class no matter what. The class of Monk may not be a secondary class option. If a character chooses to be a Monk and leaves that profession then he will forever remain at the skill level he achieved and can gain no more experience. Any character choosing to become a monk leaves off his former profession forever and can no longer advance in that class. Finally, this is a game of continuity so that there must be a plausible and playable combination and justification in creating a dual class character. Those who follow a god of healing cannot then expect to maintain any of their abilities if they leave off and become an assassin or necromancer, etc. There might also be crossover skills and it should be noted that there will not be stacking of these abilities and this applies to someone who follows one Mage Caste career and then switches to another. They will not be getting an additional battery of Power Points. They would retain and make use of their current Power Point total and then begin to add to it once they reach the appropriate level and would thereafter gain the standard amount of 1d4 plus bonuses regardless of the fact that they are advancing in skills in two classes.